A new study using Chandra data shows how a giant solar storm can ignite auroras on Jupiter. Storms from the Sun occasionally release extremely large streams of particles via winds that travel through space. New data show the interaction between the solar wind and Jupiter's magnetosphere can trigger auroras on the gas giant. The Sun constantly ejects streams of particles into space in the solar wind. Sometimes, giant storms, known as coronal mass ejections (CMEs), erupt and the winds become much stronger. These events compress Jupiter's magnetosphere, the region of space controlled by Jupiter's magnetic field, shifting its boundary with the solar wind inward by more than a million miles. This new study found that the interaction at the boundary triggers the X-rays in Jupiter's auroras, which cover an area bigger than the surface of the Earth. These composite images show Jupiter and its aurora during and after a CME's arrival at Jupiter in October 2011. 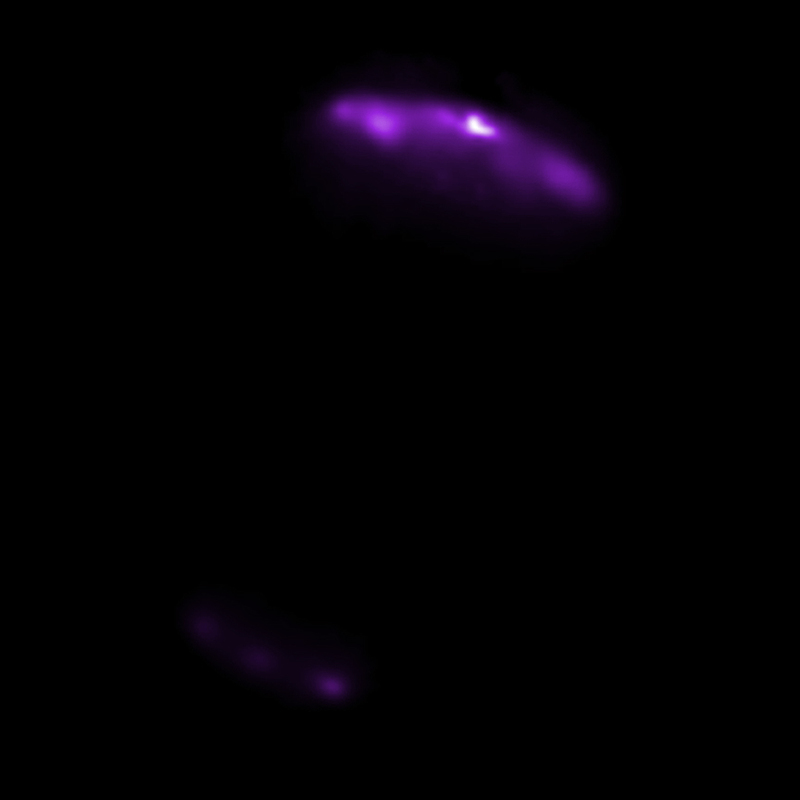 In these images, X-ray data from Chandra (purple) have been overlaid on an optical image from the Hubble Space Telescope. The left-hand panel reveals the X-ray activity when the CME reached Jupiter, and the right-hand side is the view two days later after the CME subsided. The impact of the CME on Jupiter's aurora was tracked by monitoring the X-rays emitted during two 11-hour observations. The scientists used that data to pinpoint the source of the X-ray activity and identify areas to investigate further at different time points. They plan to find out how the X-rays form by collecting data on Jupiter's magnetic field, magnetosphere and aurora using Chandra and ESA's XMM-Newton. A paper describing these results appeared in the March 22, 2016 issue of the Journal of Geophysical Research. The authors on the paper are William Dunn (UCL), Graziella Branduardi-Raymont (UCL), Ronald Elsner (NASA's Marshall Space Flight Center), Marissa Vogt (Boston University), Laurent Lamy (University of Paris Diderot), Peter Ford (Massachusetts Institute of Technology), Andrew Coates (UCL), Randall Gladstone (Southwest Research Institute), Caitriona Jackman (University of Southampton), Jonathan Nichols (University of Leicester), Jonathan Rae (UCL), Ali Varsani (UCL), Tomoki Kimura (JAXA), Kenneth Hansen (University of Michigan), and Jamie Jasinski (UCL). Scale Each image is 60 arcsec across. Observation Time 10 hours 50 minutes each pointing. I'd love to see the space station, I bet it's like deep space 9.